Little bit about me! I'm guest blogging, I'm Clare's younger sister, Kelly. I just graduated from high school on Sunday. So, graduation season is here!!! Yay, right? But if you're sitting there thinking, "Darn, I need to buy a grad gift or card." Don't fret! The just graduated is here to help you out! For your own reference, every grad is different. My tips may not actually help you if your grad is not like me at all. But if they are, well lucky you! 1) Do give the grad something. Maybe you're strapped for cash, but grads like cheap stuff. Give an inexpensive card ($.50 cards from the dollar store rock.) and some stickers inside. Most kids my age still get crazy excited when the dentists offers them a super hero sticker for being good at the appointment. If you wanted you could buy a pack of movie tickets from a club store (Costco, Sam's) and throw one in. I got some and I loved them! 3) Gift cards are AMAZING! Buy the grad a gift card. Most grads love to eat, McDonald's is a perfect choice. But nobody minds pizza either... Or consider what they really love: one of my favorite gift cards? To Ulta, because I'm a make-up junkie! Or Redbox credits...love a movie! 4) Canddddyyy! Buy the grad a "100 Grand" candy bar and call it good. Or stuff a bag or tiny box full of the grad's favorite candy. It will be one of their cooliest gifts. 5) Lastly, put the gift receipt in the bag. If you did, wonderfully, buy the grad an actual gift they may need to return it. 1) Give the grad nothing. Even if you just give some good advice, something is better than nothing. Trust me, we notice and feel sad. 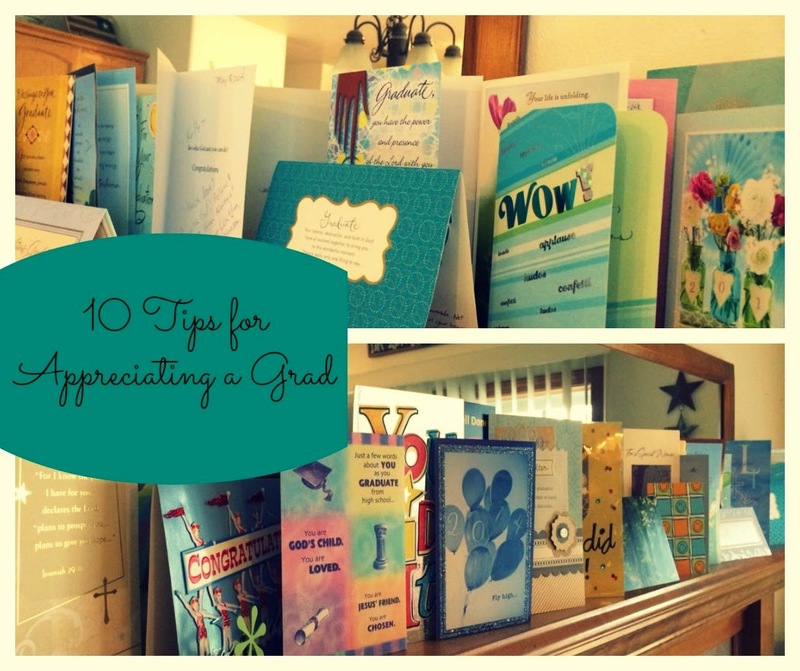 2) Don't give the grad one of those weird things they sell in all the stores for "Grads". They're super weird and nobody really wants them. Stuffed dogs you can autograph? Smiley face balls that have on caps with tassels? Umm, if your four year-old would love it, probably you should skip it! 3) Don't tell the grad that you forgot they were graduating. It's awkward... Just let it be. If you forgot, move on. The grad doesn't want to have that awkward conversation. 4) Talk about how lame graduations are. Grads are tired, stressed, and ready to be done, don't exacerbate their stress by making them feel bad for receiving accolades. Now, go celebrate that grad! 1. Write your return address on the envelope. Even if you aren't mailing it, do it anyway. If that seems strange, here is why: it makes "thank-you" notes so easy! The grad (or at least his or her mom) wants to tell you how great your gift was. This makes it easy! 2. Ask the grad's parents for ideas. If you want something more unique than cash or a gift card, ask the student's family or friends about their interests. You may end up giving them something they will cherish! They can tell you their favorite candy or their tee shirt size. 3. Consider a gift of "time". Perhaps you could arrange a movie date, or meet the grad for coffee or ice cream. They can tell you about their plans, or just take a few minutes to relax after all the finals craziness! Even just grabbing half-price drinks at Sonic is a cheap, but thoughtful way to say, "I'm proud of you"! 1. Don't infer that every grad is going away to school! I know that with the ever increasing costs of education, many students are staying home for their first few years (or all of them!). Those grads wouldn't need gifts like laundry bags or towels, because mom already has them covered! Also, remember your manners: a community college education is a valuable asset-everyone doesn't need to go Ivy-League to get a solid foundation! 2. Don't assume your $5 gift won't be as appreciated as the $50 one. Grads (high school or college) are more mature than you probably give them credit for. I was shocked that one of my sister's favorite gifts was a handmade jewelry pouch (she got some nice "swag" as the kids are calling it these days!). She loved the thought that was put into the gift, and the time. It isn't all about price tag. 3. Don't give "generic" gifts- if you were planning to do that, just give them an equivalent amount of cash, no matter how small. I still remember the stack of books I got at my graduation: quote books, "Chicken Soup for the Grad's Soul", boring devotionals. I knew that the giver had grabbed a stack at the closet discount store and handed one out to every grad they knew. It did not make me feel special and those went straight to Goodwill! Same for mugs (travel mugs are an exception!) or ceramic plaques. Would you still use those in your home? If not, it probably isn't an ideal gift. I was really surprised at some of the things Kelly mentioned when we were discussing this topic, so I am so glad she was willing to share her insights with us! It all boils down to thoughtfulness-really think about what the recipient would love when you are giving a gift and you can't go wrong, no matter the occasion. I realized that when we moved recently that this was the first "major" move for our kids. We had moved in town, but not out-of-state. (We moved several times before Josie was two, but of course she doesn't remember that!) It is a tough thing! The place where we had lived for seven years, made wonderful friends and lots of memories, would soon be nothing but a memory itself. You aren't really prepared as a mom to watch your kids crying over the only friends they have ever known! You can't really erase that sadness, and for many families (especially the military!) moving is just a fact of life. However, I wanted something that my kids could do to make it a little less "blue". 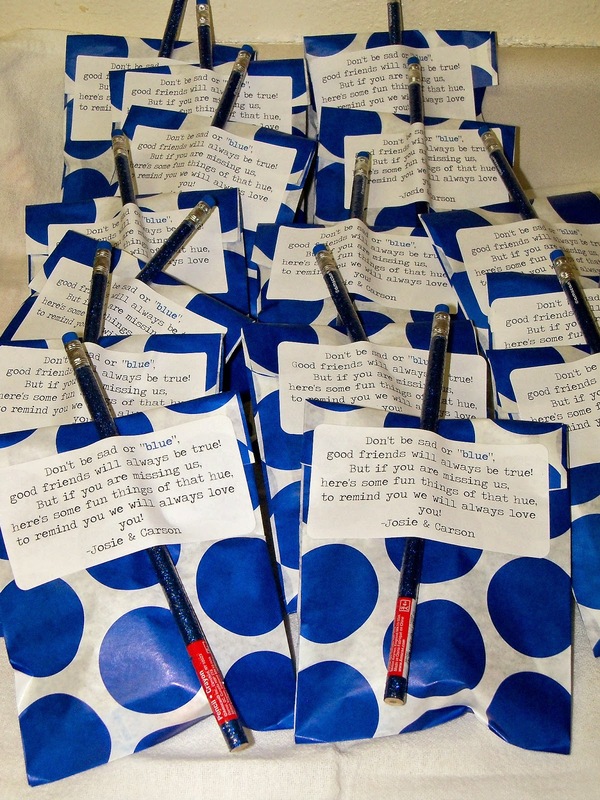 So we put together these "goodbye bags" for them to give to all their friends! We decided to go with a blue theme-it was just too perfect! The great part about this is that if you are the friends being "left behind", you can still use this idea! The poem would work either way. 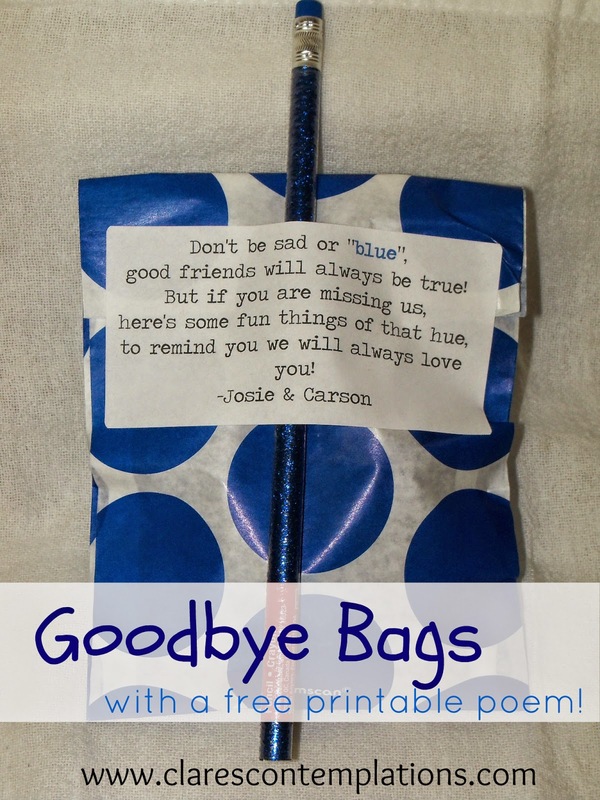 So, if you are moving, or know special people that are, fix them up a little goodbye bag to make the parting a little sweeter! I bought everything at Party City (something *I* am missing, since we do not have one in our new town-that makes me want to cry!) because you buy the items individually and can choose the colors. The candy was all $0.05-$0.10 per piece, the erasers, balls, and pencils were each $0.25. The bags were 20 for $1. This kept the cost for each bag right around $1 each. However, if you do not have a Party City there are still places (Walmart, Target, etc.) where you can choose party favors individually, for the same type of concept. 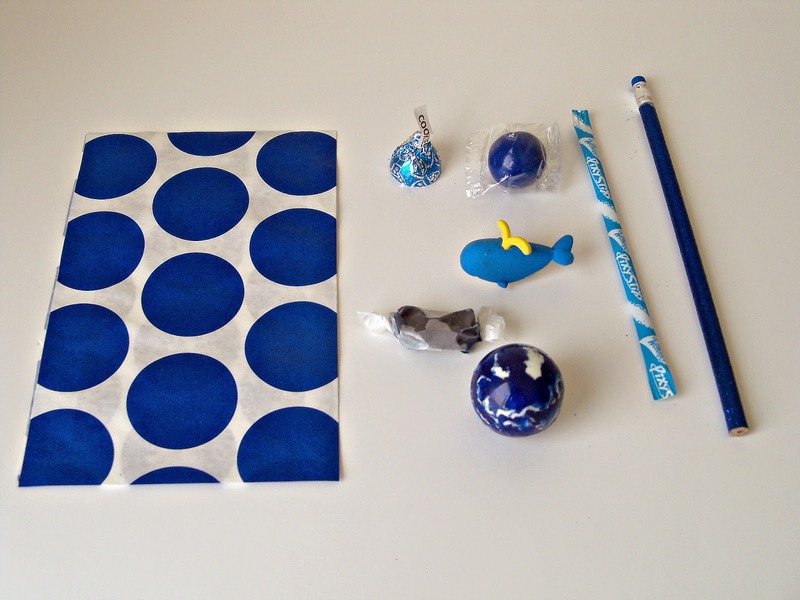 You don't have to use the same exact items, just make sure everything is blue. I chose things that I felt would be appreciated by boys or girls, and be somewhat useful, not just clutter. My kids always seem to need pencils and erasers! good friends will always be true! I printed mine on the sticker labels, but for you I made printables! Yay! Right click on the image to download/save and then choose "print" from saved location. You can easily glue or staple the labels to the bag of your choice. You could also punch a hole and tie it on with ribbon. I then folded down the tops of my bags, laid the pencil on it and then stuck my label over the pencil, to hold it on and keep the bag closed. My kids loved handing them out to their Bible study friends, and it helped to distract everyone from pitiful, tearful goodbyes. Now my kids have much happier memories of their last time at study! 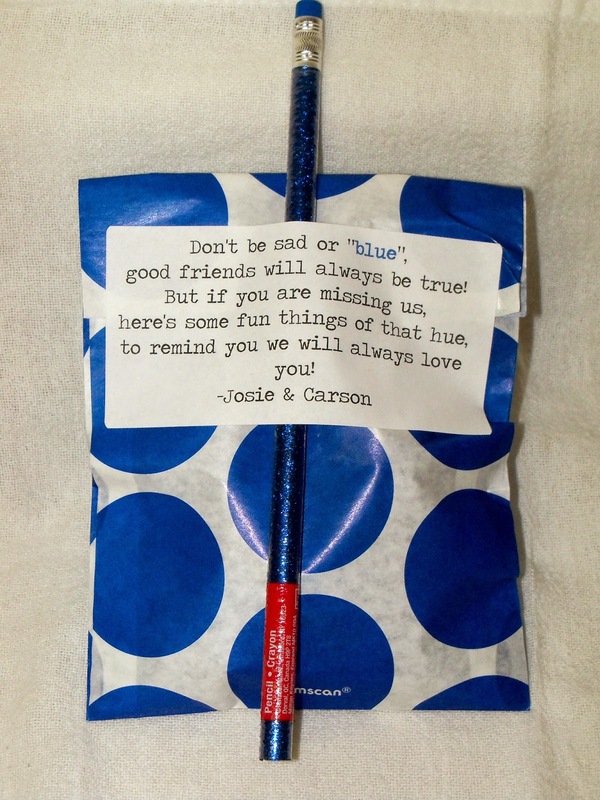 Another great way to use these would be to give them to someone who is leaving, perhaps filled with blue items for their road trip or plane flight. You can have your child add his or her name to the bottom of the label or printable to personalize it, too! You could even use this for adults, and maybe put in blue items that they could use in their new home. 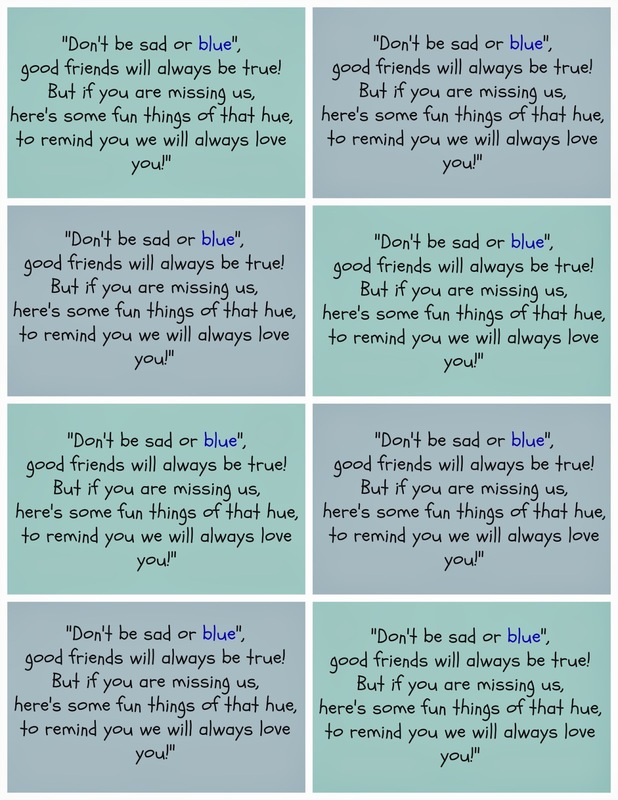 Then when they see their "blue" items they will have fond remembrances, not just sadness!